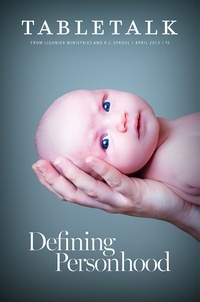 The April 2013 issue of Tabletalk examines the nature of personhood. Throughout history, systematic persecution has resulted whenever oppressors redefine human personhood and rights in a way that excludes members of the oppressed group. Scripture, however, reveals that all human beings have dignity, personhood, and rights given to them by our Creator. Christians must affirm God’s perspective on human personhood and dignity, and, therefore, stand against every form of dehumanization in our day, especially the dehumanization evident in the scourge of abortion. Contributors include R.C. Sproul along with W. Robert Godfrey, Mark E. Ross, Justin Holcomb, Randy Alcorn, R.C. Sproul Jr., Scotty Smith, Ted Turnau and Rosemary Jensen .